Maximum product safety, best in class precision and performance, reliable reproducibility and lowest energy consumption: at Medtec Europe from 26th to 28th February 2013 in Stuttgart, Germany, ENGEL AUSTRIA will be demonstrating how medical technology manufacturers can implement continually increasing requirements in a cost-efficient way thanks to innovative turnkey solutions. In Hall 1, Booth I20 the Austrian injection moulding machine manufacturer and automation expert will be producing auto-injector parts in two-component technology. “Medical product manufacturers increasingly need to pay attention to unit cost per piece. Process integration offers enormous opportunities here, and this explains why multiple-component applications are so rapidly gaining in importance in this industry”, emphasises Christoph Lhota, Head of ENGEL Business Unit Medical. 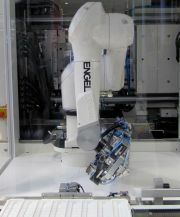 Highly-integrated and automated production cells reduce investment outlay and operating costs; the systems typically need far less floor space; there is no need to store intermediate products, and – in many applications – process stability and end product quality can be increased by merging what were previously separate steps. As an example, ABS and TPE will be processed in a single step, using a servoelectric 16+16x index platen mould, on an ENGEL e-motion 80H/80W/180 T WP combi in cleanroom design at Medtec. ENGEL is implementing this exhibit in cooperation with system partners, including Hack Formenbau, SHL (Scandinavian Health), Piovan, Max Petek Reinraumtechnik and Stäubli. The parts will be manipulated by an ENGEL easix multi-axis industrial robot that is fully integrated with the injection moulding machine’s control unit. Control integration helps processors to achieve additional efficiency potentials. The move instructions for the robot are built into the machine’s control unit so that the machine operator no longer needs to familiarise themselves with two separate control logic approaches. Many jobs for which the legacy approach meant calling in programmers can now be handled by the machine operator themselves, thus improving the availability of the production plant. Because the integrated robot can access the machine parameters, interaction between the robot system and the machine movements can be optimised. For example, the integrated robot can start to take off moulded parts before the mould is fully open, thus reducing cycle time. As the trend towards more productivity and efficiency in the injection moulding process increases, processing machine performance requirements become tougher. Over recent years, ENGEL has consistently geared its all-electric ENGEL e-motion injection moulding machines for high performance. ENGEL’s all-electric injection moulding machines are capable of achieving cycle times well under three seconds, and injection speeds of more than 500 mm per second. To tailor the e-motion machines more closely to the plastics processor’s individual needs, ENGEL has extended its medium-sized machine range. Machines with 160 and 220 tonnes clamping force have been added to the range. iQ weight control, ENGEL’s online process control for injection moulding machines with electrical injection units, is another innovation. The software, for which ENGEL has applied for a patent, detects fluctuations in the ambient conditions and raw materials and compensates for them in the same shot. To allow this to happen, iQ weight control analyses the pressure profile at screw positions in real time during the injection process and compares the measured values with a reference cycle online. Based on this, the system computes a new set of process parameters which allow changes in the melt volume and material viscosity – the two most important factors when it comes to the quality of moulded parts – to be detected immediately. In case of deviations from the set values, the relevant process parameters are readjusted automatically, thus avoiding any impact on mould filling. At Medtec, ENGEL will again be demonstrating its cleanroom competency. The production cell is encapsulated as a cleanroom. The integrated tray server was developed by ENGEL specifically for cleanroom applications, where the discharge and feed systems have often been identified as the cause of contamination. To reduce abrasive wear and particulate matter load to a minimum, ENGEL uses only GMP-compliant materials for trays and belt conveyors and does without direction changes. The trays help to feed the moulded parts to a downstream assembly machine in the correct orientation. One day before the trade fair doors open, ENGEL is launching an industry meeting for medical technology experts. ENGEL med.con takes place on 25th February 2013 in Wurmberg near Stuttgart. Customers, partners and interested parties are cordially invited to come together at the new ENGEL Deutschland Technologie Forum Stuttgart to discover more about innovative machine and automation technologies, process engineering and turnkey solutions, discuss the latest trends and exchange views and experiences with other experts and processors. ENGEL med.con is not a purely trade-only conference, but also designed to purvey practical know how. The new ENGEL subsidiary’s huge technology centre provides the perfect backdrop for exhibiting several machines to demonstrate how efficiency potentials can be leveraged to the max in the medical technology industry.